The right training: be sure of it. 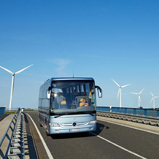 Modern traffic situations place heavy demands on both your drivers and your buses and coaches. Our OMNIplus DriverTraining courses are officially recognized as further education courses according to the Certificate of Professional Competence (Driver CPC). They help you to be well prepared for any situation. We make our extensive expertise as a renowned manufacturer available to you in specific training courses. 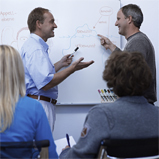 Gain skills to deal with emergency situations and avoid accidents. Regulations and digital control devices. Teaches regulations about driving and resting times and prepares you for your next control. Not only saves your money but also the environment. For authority in situations of conflict with passengers.